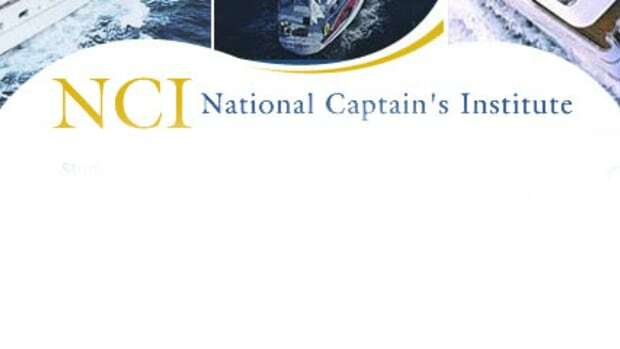 Boat owners and operators should know the federal and state requirements for Visual Distress Signals and how to use signaling devices in an emergency. VDS can be pyrotechnic (giving off smoke and/or flame: flares, for example) or non-pyrotechnic (flags or electronic equipment). If you choose pyrotechnic devices, you&apos;ll need a minimum of three signals for day and three for night, or just three pyrotechnic VDS approved for both day and night use. One distress flag (a flag at least 3 feet by 3 feet) in international orange with a black circle and square. 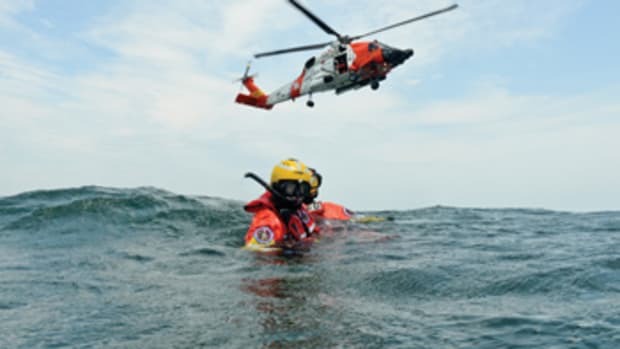 Federal regulations state that vessels operating on U.S. coastal waters, the Great Lakes and territorial seas - as well as on directly connected rivers, bays, and other waterways up to a point where the waterway is less than two miles wide - must be equipped with U.S. Coast Guard-approved visual distress signals. 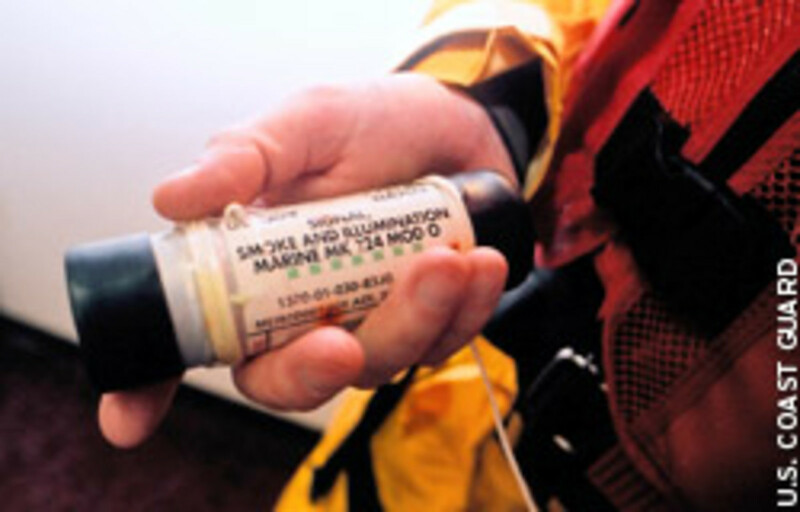 Boats owned in the United States and operating on the high seas must also be equipped with VDS. a boat competing in an organized marine parade, regatta, race, or similar event. Every boat operating between sunset and sunrise must carry VDS suitable for night use. That sounds a little confusing, but when you think about it the excluded boats typically operate during daylight hours and even then usually do not venture very far offshore. Bottom line: if you are out at night on waterways covered by federal regulations, you must have nighttime VDS aboard regardless of the size or propulsion of your boat. While there may be circumstances where VDS are not required by law, emergencies can arise suddenly and unexpectedly. That being the case, it&apos;s always better to have them and not need them, than to need them and not have them. 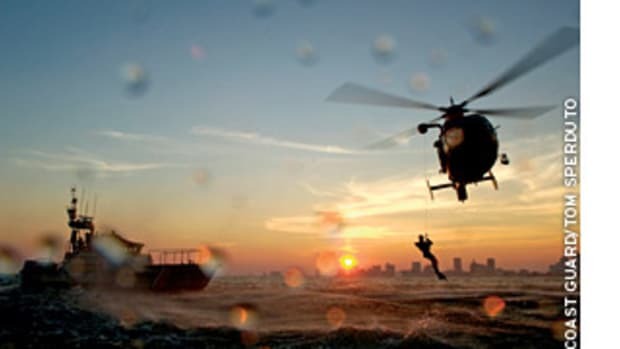 An advantage to non-pyrotechnic Visual Distress Signals is they can operate for a long period of time, but they must be in serviceable condition, readily accessible and certified by the manufacturer as complying with U.S. Coast Guard requirements. Used as a day signal only. Must be at least 3 feet by 3 feet with a black circle and square on an orange background. Must be marked with an indication that it meets U.S. Coast Guard requirements. Under Inland Navigation Rules, any high-intensity white light flashing at regular intervals from 50 to 70 times per minute is considered a distress signal. Such devices do NOT count toward meeting the Visual Distress Signal requirement, however. Pyrotechnics are excellent distress signals, but carry the potential for injury and property damage if not handled properly. If children are aboard, non-pyrotechnic devices may be a better choice. Each of these devices has a different operating/burning time. Check the label to see how long each device will remain illuminated, then choose one best suited to the conditions in the area where your vessel is typically used. Store in a cool, dry place. 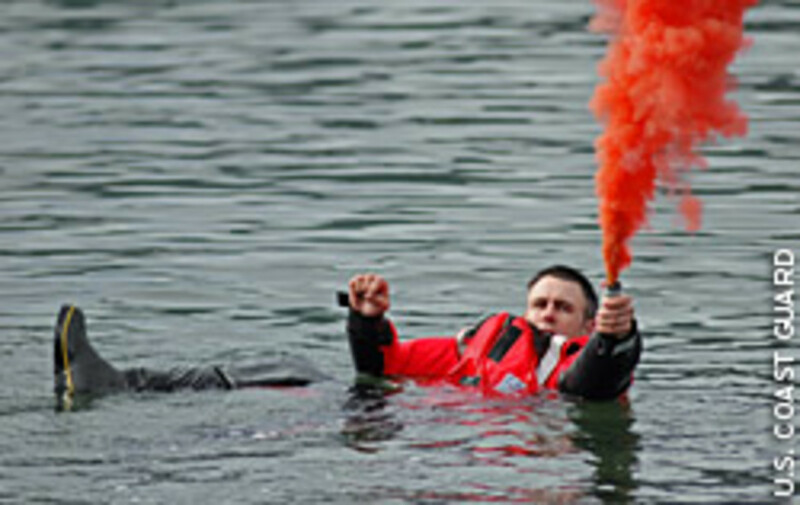 A watertight container painted red or orange and prominently marked "DISTRESS SIGNALS" or FLARES" is recommended. Hold lit flares away from the body and over the gunwale downwind; the flames are very hot and ash and slag can burn skin. Never discharge flares near a fuel tank, upwind, or in close proximity to another person. Never discharge flares if fuel fumes are detected. Hold a smoke signal over the gunwale downwind, to avoid having the smoke blow back in your face. 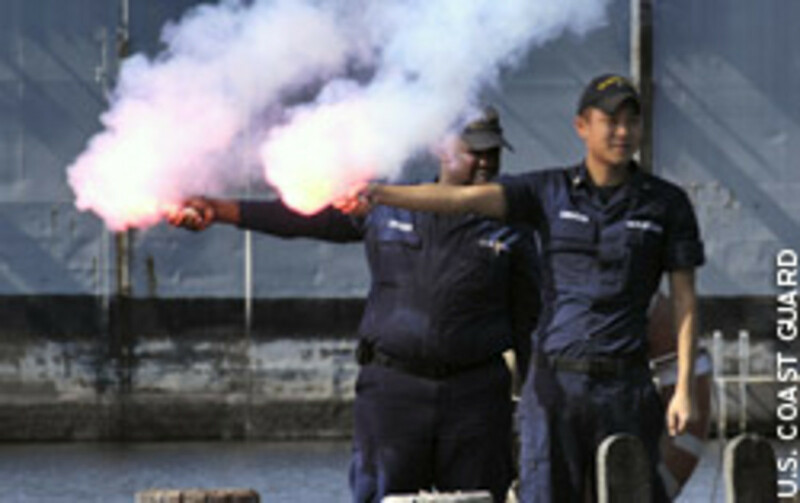 Only use flares that are certified for marine use (and only those that are Coast Guard-approved will satisfy Federal requirements). 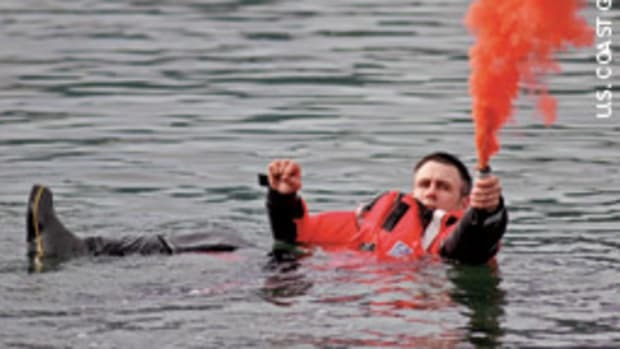 Road flares are much more likely to start a fire on a boat than those specifically made for maritime use. Check the expiration date. Expired signals may be carried as extra equipment, but cannot be counted toward meeting the Visual Distress Signal requirement, as they may be unreliable. Never set off any VDS just for fun. Sending any type of false distress is a federal offense. 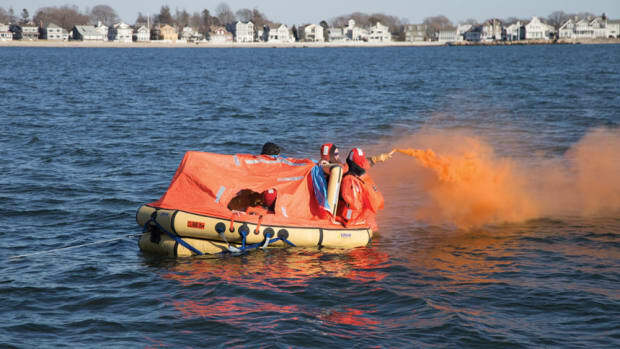 Curious boaters who want to see pyrotechnic distress signals in use should contact their local Coast Guard Auxiliary Flotilla or U. S. Power Squadrons. These organizations conduct periodic pyrotechnic demonstrations. If you need to dispose of unwanted or expired pyrotechnic devices, don&apos;t toss them into the trash where they might ignite or cause other disposal problems. 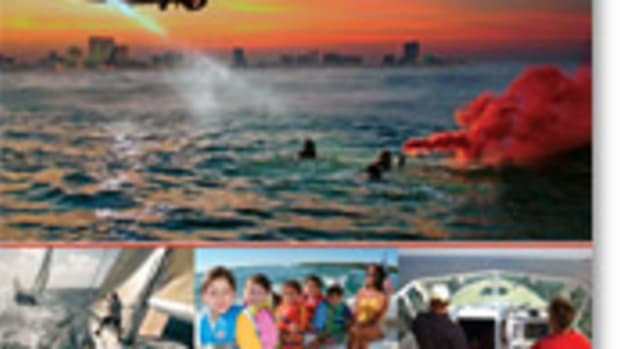 Instead, contact the local U.S. Coast Guard Auxiliary flotilla or U.S. Power Squadrons and ask if they could use them for boating safety training. You can also call the local fire department or town hazmat unit for instructions on proper disposal.